Gideon had a faith problem. He had no faith in himself, or in the fact that God could use him. Even though an Angel came to him, he still wanted some proof. Notice through the whole group of scriptures about Gideon God continues to call him a “Warrior.” God knew who Gideon was; the problem was that Gideon just couldn’t see it. He lists his lowly ancestry as one of the reasons he doubted, and the fact that the Lord had seemingly abandoned them. Gideon was looking in the natural at the natural. God sent an angel to show him the supernatural. Humbly, this mighty “warrior” asks for a sign. Patiently, God provided more than one. Isn’t God good? Bear in mind that this was before Jesus came to redeem us, we now have the Holy Spirit to lead us, so asking for a fleece instead of asking the Holy Spirit for conformation was reasonable for Gideon. How do we fix a faith issue? God tells us that we have all been given the “measure of faith,” and that faith comes by hearing His word. If you know me at all, you know that I encourage everyone to read their Bible. It is not a coffee table decoration or one for the back windshield of your car either. It won’t do you a bit of good under your bed, or in your closet. If you are in the habit of leaving it at Church so that you don’t forget it on Sunday, buy another one! Then, when you read it, read it out loud as much as possible. I learned a few things in school that I applied as a teacher. If we hear something we remember 25% of the information. If we hear something and read it also, we retain 50% of that information. If we hear it, read it, and write it, we remember 75% of that information. Now I know that is very general, and that we all have different learning styles, but this has proven true for me and many of my students. So read your bible at home, then listen to sound teaching and preaching that backs itself up with scripture, while at Church, take notes. Even if they are sloppy and you will never read them again! It will help you retain what you are learning, and sometimes God speaks to your heart and you need to jot something down (while still paying attention to the message). Gideon had an identity issue that led to a faith issue. If we are confident in who God is and how He sees us, our faith grows by leaps and bounds! Gideon did find some courage; he obeyed God and against all odds, including being vastly outnumbered by the enemy, won the victory. So what is a brother or sister to do in these times? Well, first if you have already started the party I just mentioned, repent! Then, if you don’t have anything nice to say, shut up! Take command over your mouth and don’t let it say another thing that may tarnish God’s reputation. Finally, think on His goodness. The Bible is full of scriptures that rehearse and meditate, sing about and praise Him. Find then and get them past your head into your heart. Remind yourself that you can bring your problems to God, yes, even that mess we made ourselves. He will help. He promised He would and He always keeps His promise. It may not be when we want or even how we want, but He always comes through. He’s our Father, through the shed blood of Christ we have been given the privilege to come boldly into His throne room just as our children never have to fear coming to us for help. One of the most important things we can do when things don’t look good, is change what we are looking at. Look to Him, look at Him, look at His creation, and then praise Him for who He is, what He has done, and what He is doing in your situation right now. 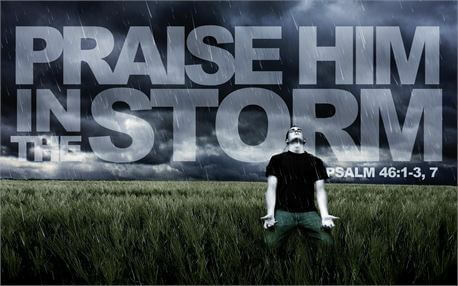 Psalm 113 (NLV), “Praise the Lord! Yes, give praise, O servants of the Lord. Praise the name of the Lord! 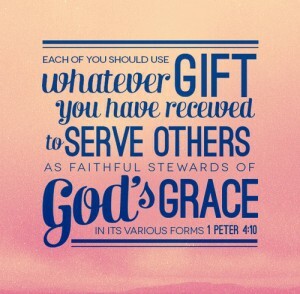 Today I lift up to You my brothers and sisters in Christ. I pray that You cause them to increase and abound in love for one another, and for all people, just as they love You. That You may establish our hearts blameless and in holiness before You. I thank You, Lord, that our faith is growing. May You give us all eternal encouragement and good hope, that our hearts are encouraged and strengthened in You in every good deed and word. I thank You for giving us peace at all times and in every way. I especially thank You that you are with us, always. I think this book has been one of the most important books I have read to date. I strongly encourage every Christian to read “When Godly People Do Ungodly Things: Arming Yourself in the Age of Seduction”. Not only would this be so helpful for someone who has fallen into sin, more importantly it will help prevent a fall to begin with. Beth Moore is a great teacher, she is kind and simple in her writing style. I am going to recommend this book to all of the ladies at our bible study and to all of my followers. I give it five stars only because I can’t give it more. Appropriate for teens and up. We all love accolades. It’s part of our society. 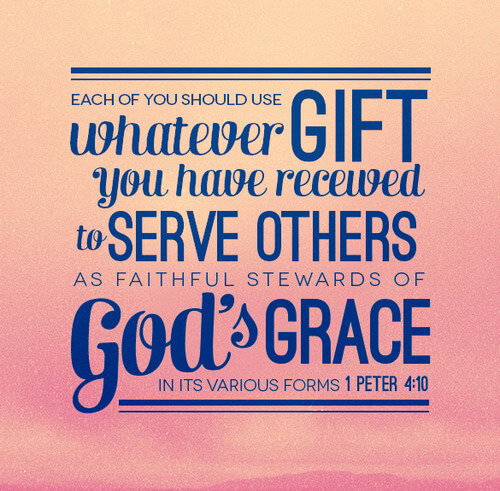 It is nice to receive honor, and the Bible clearly tells us to give honor where honor is due. However, we are never the best person to judge whether we should be honored. We are biased to say the least. We will either think we deserve nothing, or worse yet we think we deserve the most. 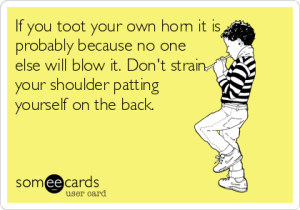 Growing up there was a pretty common saying, “Don’t toot your own horn.” It was a reminder to not brag on yourself. Most of us ignore a braggart. We shy away from those arrogant, know-it-all types. We don’t want them on our team. They simply aren’t good team players. How about at Church, those shooting stars that give glowing reports of all their good deeds? The common denominator in all of their “testimonies” isn’t the goodness of God, it’s their so-called spirituality. They begin their sentences with “I”, not “God”. In trying to honor themselves they end up looking fake-y and flaky. Those types of people have very little true impact on the Body of Christ, unless it is in a negative way. Any motivation other than love doesn’t accomplish anything for the Kingdom. Self aggrandizement isn’t a fruit of the Spirit, and Proverbs 16 clearly tells us that pride comes before a fall. That doesn’t sound like honor. Even Jesus said that if He bore witness of Himself that His witness wouldn’t be true. He let His works speak for themselves. We don’t have to tell everyone all the “good things” we do. Just do it! If you have a true testimony of what God did share it, but those testimonies never include “God used me to bless so and so.” I am sorry if this steps on some toes, but that isn’t a true testimony. Why not just testify, “so and so had a need and God met that need.” No need to bring ourselves into the picture at all. This glorifies the One who deserves it. We can’t love the praise of men. It keeps us from serving God rightly. Myself, I want to hear Him say, “well done,” not another person who is just like me. 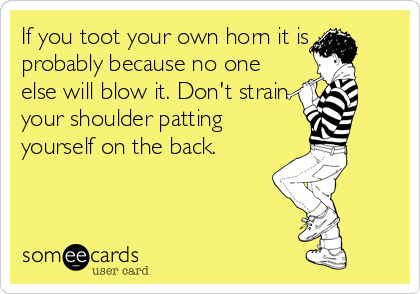 Been “tooting your own horn”? Check your heart. Let love motivate you, and give all praise to God. In the United States the spirit of ungratefulness is running rampant. Look at our Media! They preach to us constantly how we don’t have enough, or that we need this one thing, or that someone else knows what we need best. We aren’t the first people to allow this bad attitude to take over, and probably won’t be the last. The Israelites grumbled. Sometimes reading Exodus is like reading the “Who’s who” list of world renowned whiners and complainers. I get frustrated for God or sorrowful for Him when I read it. I get angry at their ungrateful, stiff necked, hearts…until I start complaining about some trivial thing. Isn’t the Holy Spirit faithful to do His job? There must have been some New Testament grumblers too; otherwise Paul wouldn’t have had to warn the Church at Corinth using those professional complainers from Exodus as bad examples. Every person still living on this earth has something to be thankful, if only the fact that you are alive. Ok, I know there will be some that say, “If you knew what my life was like, you’d wish you were dead.” I know, I’ve been there. However, if the alternative is hell, than thank God you’re alive. If your final destination in Heaven be thankful that God isn’t done with you yet, because if your work here was done, God would have taken you home. Be honest, most of us have a myriad of things to be thankful for. If you are a born again Christian, just think for a minute where your life was like before you were saved, and then thank God for where you are now! If we really know who God is we will not have to hunt for something to be thankful for. When we fall so in love with God our hearts will be so full of gratitude that we can’t help but sing and shout His praises! We won’t even care if we can carry a tune or not, it won’t matter what anyone else thinks. We won’t be able to help ourselves. Have you ever been around someone who is in love for the first time? Do they talk of much else besides their new love interest? How excited do they get when they have a date scheduled, or a wedding? Yep, that kind of crazy love, only even greater. I love God, I have since I found out He loved me at the age of six. Growing up, I walked away from Him and didn’t live right. After years of living in the world, I forgot how much He loved me. Even after years of walking with Him, even though I thought I loved Him, it didn’t compare to how much I love Him now…or how much I will love Him tomorrow. What changed? Me! I allowed Him to show me how much He loved me, I read His word and searched out every ounce of His goodness and kindness. I rehearsed and meditated on all the good things He had done for me, and I practiced an attitude of thankfulness. Am I thankful all the time? No, I still have my “would you like some cheese with that whine” moments. But, I am pleased to say they are fewer and farther between. Do you know what else I discovered? An attitude of thankfulness touches others. When we are thankful for what we have and are willing to share. Think about that little boy with five loaves and two fishes. He had to have been thankful for that little lunch that someone had packed for him; otherwise the disciples wouldn’t have even known that he had the basket of goodies. I can hear the question, “does anyone have some food?” and our little hero says, “I do, my mom packed me two nice fish and five of her best little loaves”. Can you hear the thankfulness in his voice? I am sure the disciples wouldn’t steel a little boys lunch, so it is safe to say he offers to share. When you appreciate what God has given you, you don’t get greedy and selfish, you know He will provide again. So, they bring that lunch, big enough for one little boy, and what does Jesus do- yep, He gives thanks! Now, I know it is hard to wrap our heads around this, but force it if you need to, that little lunch fed five thousand men, along with untold numbers of women and children. When we are thankful for the people in our lives, we treat them with respect, we honor them, and we aren’t constantly looking at their faults and failures. When we are thankful for our jobs, we work harder, behave better, and show up for work on time. When we are thankful for our Church family, we show up for service, we offer to help out, and we don’t gossip and finger point as much. Are you starting to get the picture? It is something that has to be actively worked out, worked on. God doesn’t just implant thankfulness in us. We become thankful on purpose. Now I am not one to encourage “faking it” but sometimes we have to do things that we don’t feel like doing. 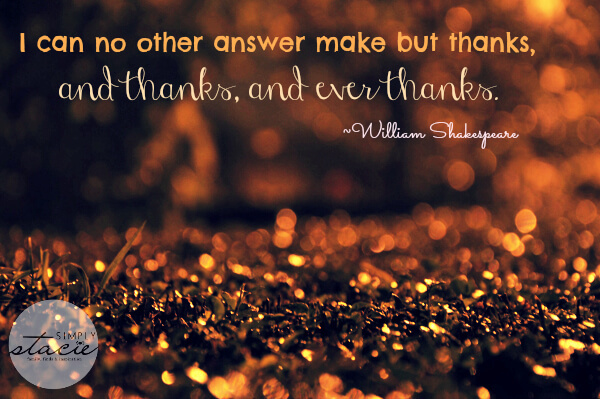 You may not feel thankful, but you better start saying “Thank You”. Tell the lady who checks out your groceries, the man who held the door, the mailman who delivers your package, your husband for taking out the trash, thank you! Yes, I know that some of that is part of their job descriptions, but so what! Thank them. Get a pen and paper when you have finished reading this and write down everything that you are thankful for today. Nothing is too little or too big. Then every night before you go to sleep, look back over your day and thank God for what He has done for you, given you, or just for Who He is. Do this for fourteen days and a new wonderful habit of thanksgiving will be birthed in your heart. If you have allowed your heart to dry up, or your neck to become “stiff” like those wondering Israelites, it may take a while before you feel it. Dive into the word and search out scripture that talk about the goodness of God. Read His promises and if they haven’t manifested yet, thank Him for them anyway. They are coming. Allow those roots to be firmly and deeply planted in Him, the outcome will be abounding thanksgiving. You won’t be able to keep it in. It will overflow. Did you ever know someone who was great at getting involved, in starting new projects, enrolling in a college classes, setting goals, and making resolutions…but they weren’t so great at finishing anything. I have, several in fact. I was brought up to finish what you started. You ate what you put on your plate, if you signed up for ball; you went to every practice, you stuck it out. In fact it was such a big thing, and I had very little self confidence, that I hardly ever committed to anything. If I knew I could do it, without a doubt, then I’d go for it. Thank God, I have found my confidence in Him. I’ll give just about anything a try if it pleases Him. If I mess it up, it won’t be from lack of effort. So, you’d think I would have a lot of “success” under my belt. We have a real enemy that tries to get us off the track. He will do anything to derail us, slow us down, or get us to even move backwards. That’s who he is. He comes only to steal, kill, and destroy. (John 10:10). He doesn’t have a single other agenda. To put it simply his job is to get us to quit, back down, or give up. You can’t get him to stop attacking. That happens when we get to heaven, and he gets to hell. Don’t lose heart though, you can repel, and counter attack anything and everything he throws your way…if you have surrendered your life to the One who is all powerful. God has given us weapons, and protective gear. He has warned us of the wiles of the Devil, and placed before us simple instructions on how to overcome. Jesus already did, He defeated the devil over 2000 years ago. We just carry on in that knowledge. We battle a defeated foe, a lion who can only make noise because his teeth have been pulled. So why does it feel like we have gotten our ears boxed? Or maybe you have been in the same battle for years, and you haven’t even given much thought to the war. What’s the problem? Since you didn’t hear the message, I’ll clue you in on the concept. When we know, not with our head, but in our heart, truly know, who God is we have unlimited power at our disposal. Think of it in this way, if you know God is your healer, you believe with all of your heart that Jesus’ stripes purchased your healing, you will stand firm against every bodily attack. You won’t be fighting the sickness, you will be fighting the fight of faith, the fight to remain true and committed to God and His word. Look at Job, Satan had permission to wreck havoc on Job’s life, yet Job didn’t “curse God and die” as his loving wife recommended, no, he kept his faith. Sure it wavered a little, we are human, but he never gave up on God. He stayed committed to the One who was able to bring him through. When we know that our Father is the King, we can walk in our authority as princes and princesses. We command those who are subject to us (which according to the word is pretty much anything that is in the way of us fulfilling our destiny in God.) The key is to know who He is, know who we are, and submit to the King. When we know what His plan is, we can walk on the right path, recognize the obstacles, and command them to move. 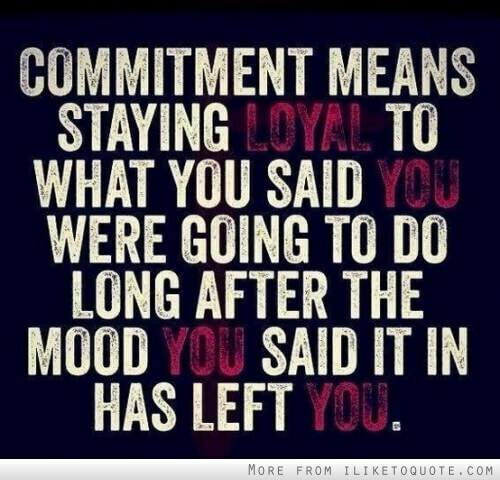 We have to be committed. 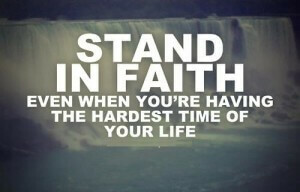 We have to “set our faces like flint”, “quite like men”, “run the race with patience”, and “stand firm”. It’s only when we do those things that we will receive the promises. Romans 12:11-12 (Aramaic Bible in Plain English), “Be diligent and do not be lazy; be enthusiastic in spirit; be working for your Lord. Be rejoicing in your hope. Bear your afflictions bravely. Be persistent in prayer. Have you mastered the art of quitting, well quit it! 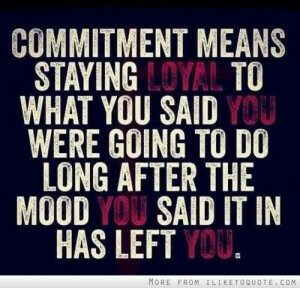 Press on to master the art of loyalty and commitment. He is worthy of our commitment! We won’t be the only ones who will benefit from our perseverance. When we fulfill the call God has placed in our lives, when we use the gifts and talents He gave us, so many people are blessed. Lives are changed! The Kingdom is built!